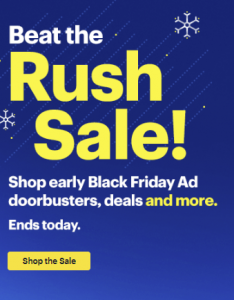 Best Buy Beat the Rush Black Friday Sale Expires: 11/17/2018 - Free Shipping with no minimum. Samsung 4K TVs are at Black Friday prices. Select American Express cardholders can get a one-time $30 statement credit on purchases $300 or more (sign up under AmExpress offers on your card's online account).